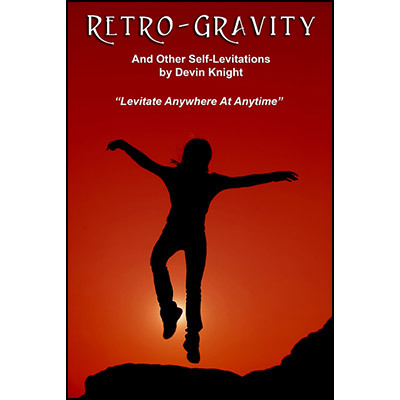 If you haven't heard of Retro-Gravity, it was a self-levitation that Al Mann and Devin Knight created over 20 years ago. It has been kept under wraps all these years. Whispered about on the underground, and hinted that it would be released someday... That day is NOW. Retro-Gravity allows you to levitate 2 to 4 inches in the air. It is a special gimmick you attach to your shoe and once done is completely invisible. Any time you wear your shoes, you are ready to levitate. Anywhere, anytime under any conditions! This means you can walk around in a restaurant, party or out door festival and levitate over and over at will. No special pants, jackets or special clothing are required. NO BULKY GIMMICKS TO CARRY AROUND! No palming off or adding anything. The bottom of your shoes can be shown before and after the levitation and they are seen to be normal. But, that is not all, the manual describes how to allow an assistant to pass something both feet while floating. PLUS advance techniques that allow you to rotate 180 degrees in the air while floating. Lift both feet while floating to show nothing under them. A technique that allows you to float up to 8 inches for a split second. Mat Levitation: Stand on a mat and float up 4 inches. Al Mann Newspaper Levy: Stand on a newspaper float up and someone pulls the paper out from under your feet. A sneaky way to do the Balducii Levitation and never get caught. You get the complete manual explaining how to do Retro-Gravity. A simple item found in any hardware store is invisibly attached to your shoes and allows you to do this levitation at anytime, with no thought or advance notice. Anytime someone walks up to you and says can you levitate like that guy on TV. You say yes, and float right up, then and there. Retro-Gravity allows you to do all this and much more.